Hello, everyone! 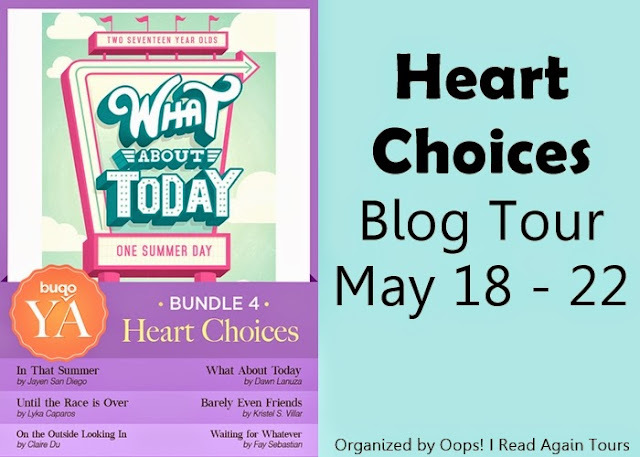 Welcome to my stop for the blog tour organized by Dianne in support of the Buqo YA Bundle 4: Heart Choices. I'll be sharing excerpts from the stories in the bundle with you today. Gusto ko siyang samahan kahit ngayong araw lang. Gusto kong pasayahin siya kahit para sa kanya corny. Gusto kong kahit ngayong araw lang, makalimutan niya ang sakit na nararamdamn niya sa babaeng ‘yon. Sa maswerteng babaeng si Lianne na hindi man lang na appreciate ang lalakeng tunay na nagmamahal sa kanya. Oh my freakin’ ball of fire. That was HIS voice. I composed myself and slowly raised my eyes. Unconsciously, I batted my eyelashes, so he could see how long they were. His hair was ruffled, his forehead glistened with sweat, and he had these lines between his eyebrows as a result of him frowning. But that face, with the thick brows, piercing brown eyes, and those lips that looked better when he smiled—that was the face I couldn’t seem to get tired of staring at. Aiden's stuck working for his family's amusement park, Funtastic World, for the whole summer. Nothing amuses him, until he met this terrified girl. Gemma's stuck in Funtastic World thinking she could handle the park's rides. She couldn't. Good thing she met someone to guide her. And if she and Aiden were ever going to be friends, in the real sense of the word after today, how’s that going to work? They’re going to stay in touch by texting? Chatting online? It all seemed superficial. It was not like meeting someone in school; she’s required to see that person almost everyday, which made being friends with someone almost compulsory. But meetings like these...what did one do with them? Denise knew pain at an early age. She has been waiting for her true love since she was 11, but she never gave up, knowing she'd meet him someday. What she didn't know was that she already met the man she's been waiting for, and that he's sitting beside her at the airport. The thought never crossed her mind because she's seated between two guys who broke her heart before. We were in a dark and tiny broom closet. The air stank of floor wax, dust, and wood, making my nose itch. I reached up to rub my nose, but my elbow caught one of the shelves and it made a soft clatter. Noah seized my arm and cupped my mouth with his other hand, hushing me to keep me still. Kristel S. Villar covers sporting events for a national broadsheet by day and tries to write fiction by night. In between, she takes care of her husband and son. She has penned Blast from Two Pasts. a contemporary romance novella, and The Rumor About Me, her first short story for the Luna East anthology. Her second Luna East short story, One on One is featured in the quarterly online romance journal, Clara. Get your weekly dose of feels and get the Buqo YA bundles now! 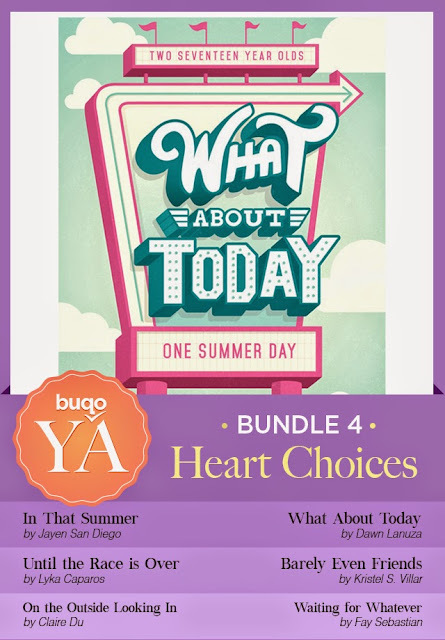 Heart Choices is available on Buqo at a special price of only $0.99 (P45) this week! Purchases can be made using a credit card or your Smart/ Sun phone. Enjoy! congrats to all the featured writers. hope to win!